Snow dusted the mountain yesterday evening. At first, I saw a gray cloud roll through the valley, and I briefly wondered if it was smoke or perhaps fog. The gray cloud rolled along the valley, through the forest, obscuring it tree by tree, slowly snaking around the trees like a cat rubbing at my ankles. As it got closer, I realized it was snow, not fog or smoke. I watched as the little storm slowly approached, marching up the mountain, seeming to gobble up the trees one by one and hide them from my sight. When the snow arrived at the cabin, it was a dense little cloud of thick snow, momentarily creating a whiteout. For a few moments the snow was falling so thickly I couldn’t see anything but swirling snow. The little storm disappeared almost as quickly as it arrived, continuing its march across the ski slopes and then down the other side of Roundtop. The photo today shows what it left behind. Normally, to this point in the season, I could expect at least 30 inches of snow to have fallen already. This year, I haven’t had a full inch. My only measurable snow was .25 inches, and though snow has fallen on most evenings recently, it is never any more than what you see in the photo. Still, February, my snowiest month, lies ahead. Although it was a chilly 15°F at the cabin this morning, statistically, the day has now arrived when the winter temperature turns towards the warmth. December 20 (or was it 21?) marked the winter solstice, when daylight reached its shortest span and then began its run towards longer days. The earth, however, like a freight train that takes a long time to stop, continues to cool for some time past the shortest day. Like the change to more light that begins in December, the change to more warmth is only a tiny change, a change of statistical averages. 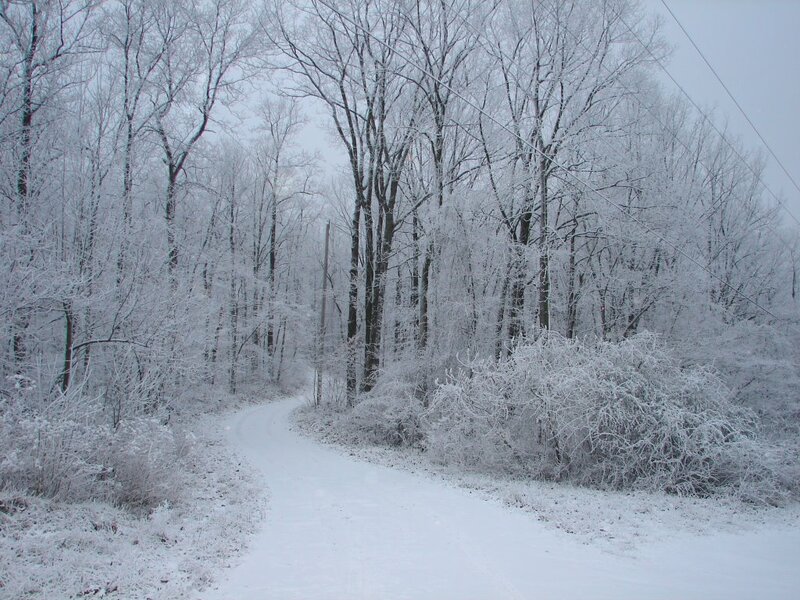 In this area, the average daytime high during midwinter is 37 degrees F. The average nighttime low is 23 degrees. Fifteen days in the middle of winter typically show the same results: average high of 37 and average low of 23. But today, the average daytime temperature vaults to 38 degrees (though the nights are still an average of 23 degrees). And so it begins again. Summer is on its way, if only just a little. I took the photo this morning over at Roundtop’s new pond. With the warmth that I saw this past December, there’s not much ice to see, though it is finally forming. 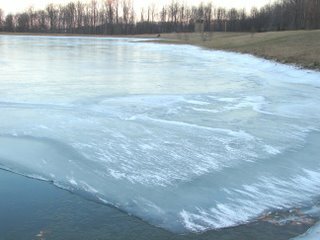 This pond never freezes very much, due as much to its spring-fed cold water as to the fact that Roundtop will pump from it to make snow. The sun's light is starting to return to my mornings. Now, it is not just the light from the approaching dawn that I can see when I leave the cabin in the morning, but the sun's light itself. As you can see from today's photo, I am not yet touched by the sun where I live, but I can see it on the next mountain. I can see it creep further down that mountain, morning after morning. The change in light from Friday to Monday is always a bit of a surprise to me. I don't take a pre-dawn walk with the dogs on Saturday mornings, waiting until the sun is up and then taking them for a nice long walk. 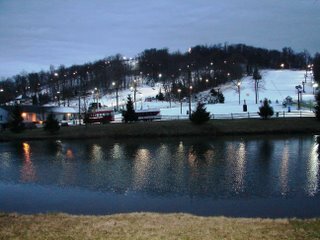 Sunday mornings I am at work at Ski Roundtop before sunrise. So it is Monday before I can see what changes just three days brings to the timing of the sunrise. 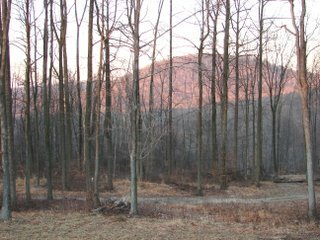 This morning, a cold and windy 10 degrees F., I heard a bluebird singing as I left the cabin. I was a bit surprised that it would be out and about so early on a morning this chilly. Bluebirds usually roost in dead or hollowed trees in winter, often in fairly large groups, huddled together agains the cold. Here, in this untrimmed, unmanaged, uncleared forest, they do well on their own, without the benefit of bluebird boxes that sustains them when people can't leave the forests alone. I have never understood why some people apparently consider a forest something that must be pruned, cleared, trimmed, dead trees cut, etc. They seem to feel such a thing is unsightly and needs the hand of humans, sort of like a large garden. I much prefer the unfettered forest, operating on its own, without intervention by humans. I like to watch and learn from the forest's own rhythms. I like to see how everything has its own place, and its own culture, if you will. Nothing is unused in a forest. Nothing is excessive. Everything is useful to some species, whether it be a bird or insects or animals. In a forest, everything is already perfect. Note: You may want to check out this week's "Good Planets" photo roundup at Laura's blog Somewhere in New Jersey (Saturday's post) . One of my photos is in it and many beautiful photos takes around the world this past week. Enjoy! It’s getting near the end of 2007’s first month, so that has prompted me to start looking at my January bird list. Overall, I’m just one species behind last year’s January of 26 species, but close enough that if weather cooperates this weekend, I might tie or with luck surpass the total of January 2006. So for those of you who aren’t up to math while reading a blog, I’m at 25 species at the cabin so far this year, and as usual I have some interesting sightings and omissions. Turkey Vulture – when the weather was warm, these were in the air. Canada Goose – the local suspects. Mallard – the local pair. Red-tailed Hawk – saw a local bird a few times. Mourning Dove – there aren’t all that common here at the cabin, so they were probably visitors from down around Roundtop’s lodge. Great-horned Owl – Heard only. Red-bellied Woodpecker – A regular feeder bird. Yellow-bellied Sapsucker – See blog entry of January 24. Downy Woodpecker – Common at the feeders. 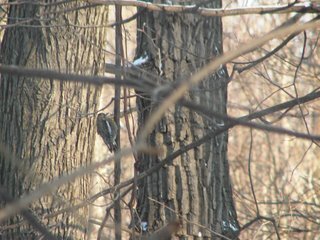 Hairy Woodpecker – Not as common as its smaller cousin but around. Pileated Woodpecker – Seen flying through the woods. 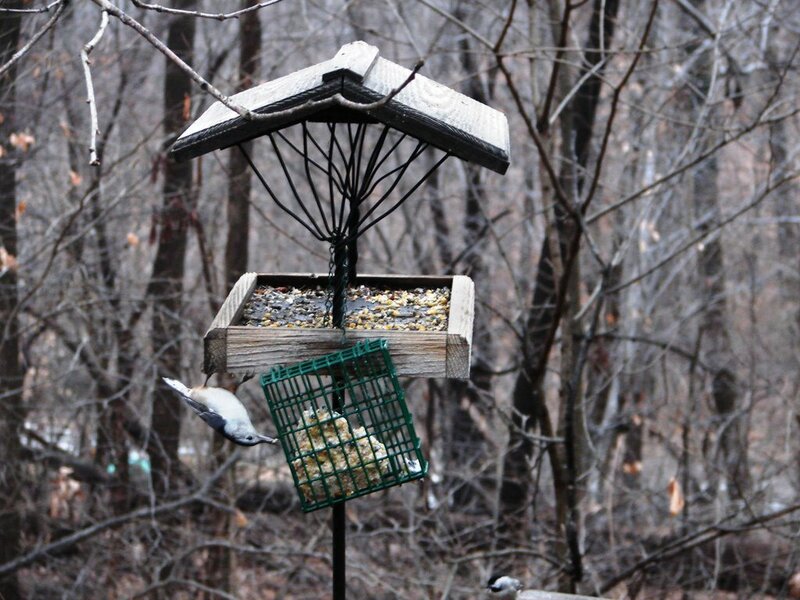 Blue Jay – Common and they’re hard on the peanuts I put in the feeder. American Crow – Not a feeder bird but they are everywhere else. Carolina Chickadee – I have both Carolina and Black-capped chickadees, and hybrids of the two species as well. 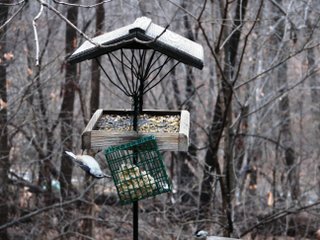 To be scientifically pure, I should just say I have birds of the chickadee species and let it go at that. But that’s not me. Black-capped Chickadee – See above. Carolina Wren – Heard singing a few times earlier in the month. Eastern Bluebird – My first bird of the new year, as I heard its song as soon as I stepped out of the door on January 1, but it wasn’t the first bird I saw. Northern Mockingbird – Seen before the weather turned cold. 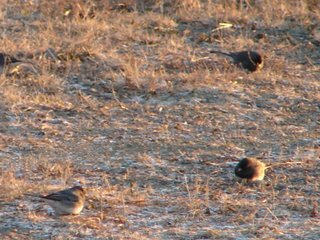 Dark-eyed Junco – Here in good numbers and my photo for the day. House Finch – Uncommon here at the cabin but common down at Roundtop. 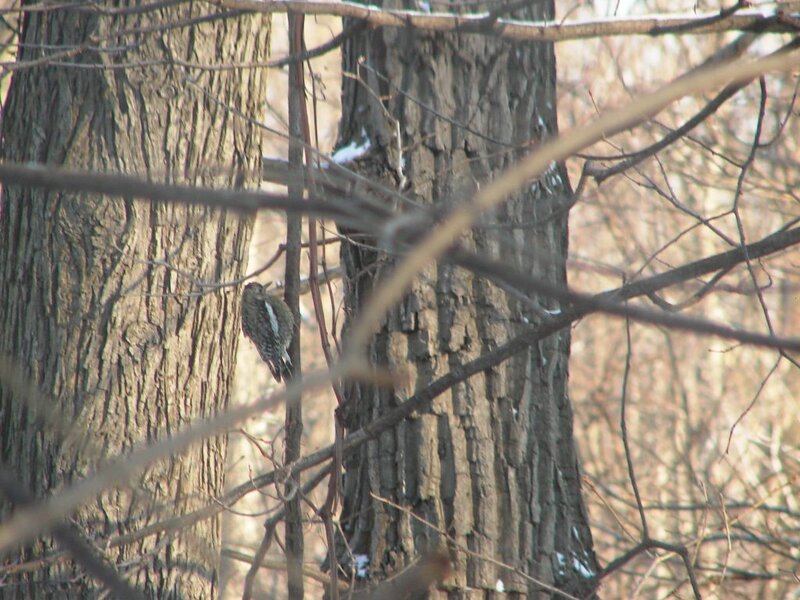 The best bird of the month is the sapsucker, and this is one I didn’t have on last year’s January list. So, what am I missing? Last year I had American goldfinch (and I should have them on this year’s list too, so I hope to see them this weekend). I also had a song sparrow last year, and I haven’t had those yet. I’m also surprised that I didn’t have American robin during the warm half of January. I did have them through late December, but missed seeing them after the year turned. 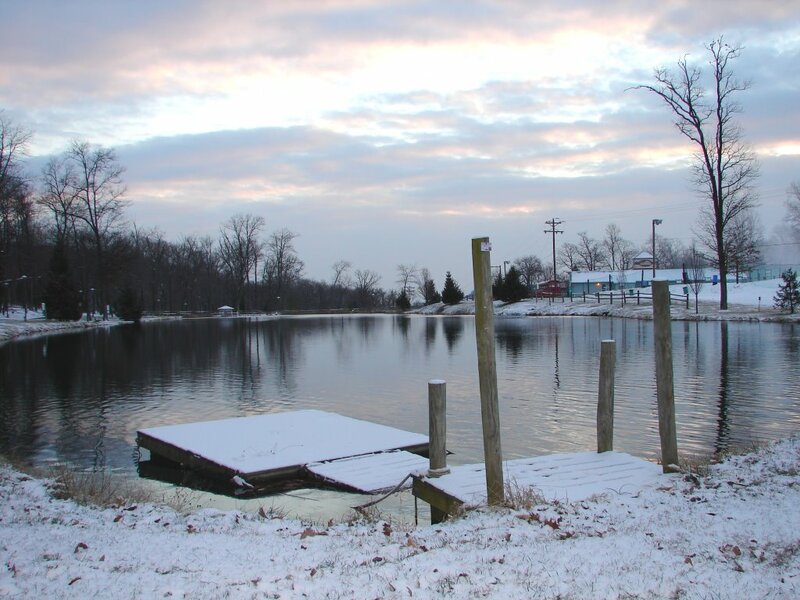 Weather: It was 4F degrees at the cabin this morning, with a 15-20 mph breeze, making it feel well below zero. This is a chilly temperature, but January 23-25 is usually the coldest part of my winter, and I usually have at least a few nights drop below zero. There's no sign of that this year, and with each night that passes, that's less likely. I had another dusting of snow overnight. This one was unexpected, though the sky was overcast all evening, and I didn’t know it had snowed until I opened the front door. Baby Dog exploded out the front door like she was shot from a cannon. She slipped on the powder, crashed into the deck chair and the cat feeder, recovered her footing and leaped off the deck, never looking back. Oh, the joys of youth. Off I went, at a much slower pace, to retrieve the ricocheting dog who was now running from one end of the driveway to the other. Snow does that to her, for some reason. Eventually, she wore herself out, we set off for our much more sedate morning walk, though she never really calmed down completely. Snow makes her giddy, and since she’s just 1.5 years old, she’s already pretty giddy. The wild critters aren’t made giddy by the snow, not at least as far as I can see. A bit of snow brings more birds to my feeders but that’s about the extent of it. The opossums and the raccoons are hibernating. 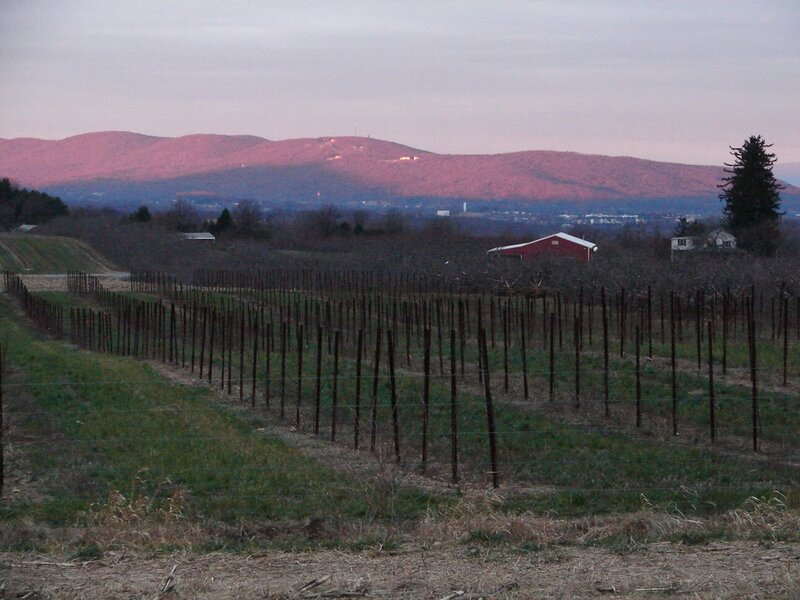 The deer still come out at dusk to graze in the field that Roundtop uses for overflow parking. I saw nine of them the other night. Squirrels raid my bird feeders daily, plopping their fat selves in the middle of one and eating until they can’t eat anymore. I have very fat squirrels. 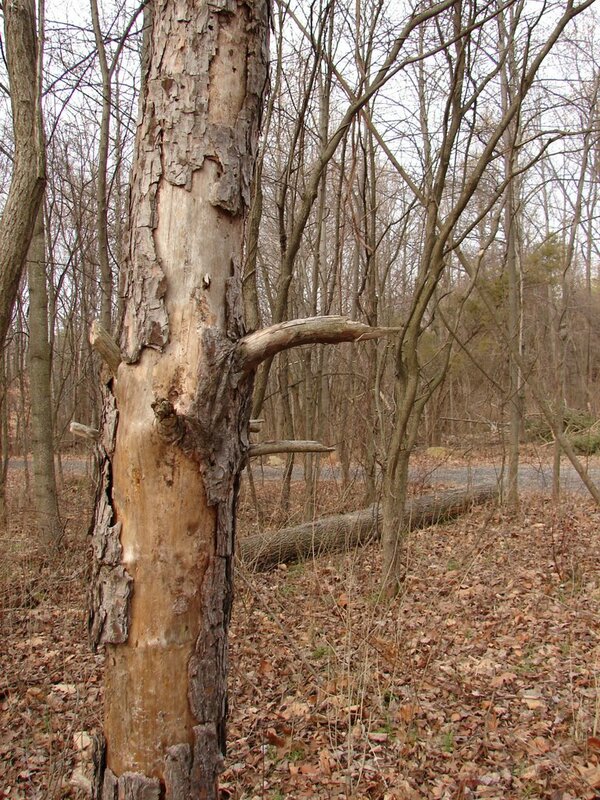 I haven’t seen turkeys or fox lately. This morning in the snow I saw a mouse trail crossing the lane and then crossing back again. It is, finally, starting to feel more like winter. 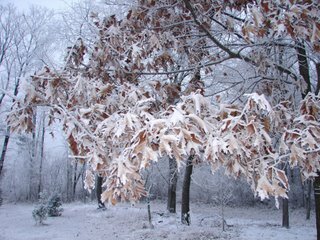 The temperature is more winter-like, and the forest is starting to take on the feeling of winter’s sleepiness, where not much happens and even that slowly. I still have a vague sense that this year winter is more like a nap than a good night’s sleep, but at least winter is no longer an insomniac. 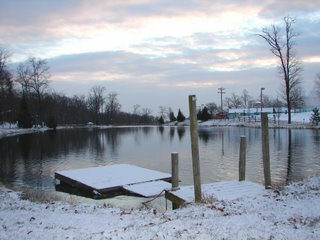 The photo today is taken down at Roundtop’s old snowmaking pond, just as the first rays of morning were breaking through the clouds. Okay, let's start off with the obvious. 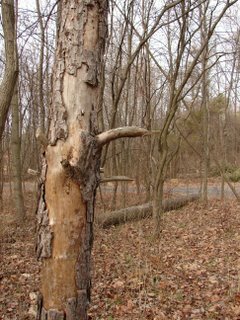 This is not the best picture you've ever see of a yellow-bellied sapsucker (juvenile). But I will bet it's the best photo you've ever seen of a yellow-bellied sapsucker that was taken by a person sitting on her bed in the cabin, shooting through a semi-dirty picture window that was four feet away, into a spot in the forest about 20 feet further away. Then when I got the shot, I used the zoom to further blow the shot up so the bird is recognizable. Considering how I got the shot, it's not bad at all. I see yellow-bellied sapsuckers uncommonly in winter--this was my first of this season. I have sightings every 2-3 years, though about half of the sightings in those years are often pretty regular, sometimes daily, for weeks at a time. 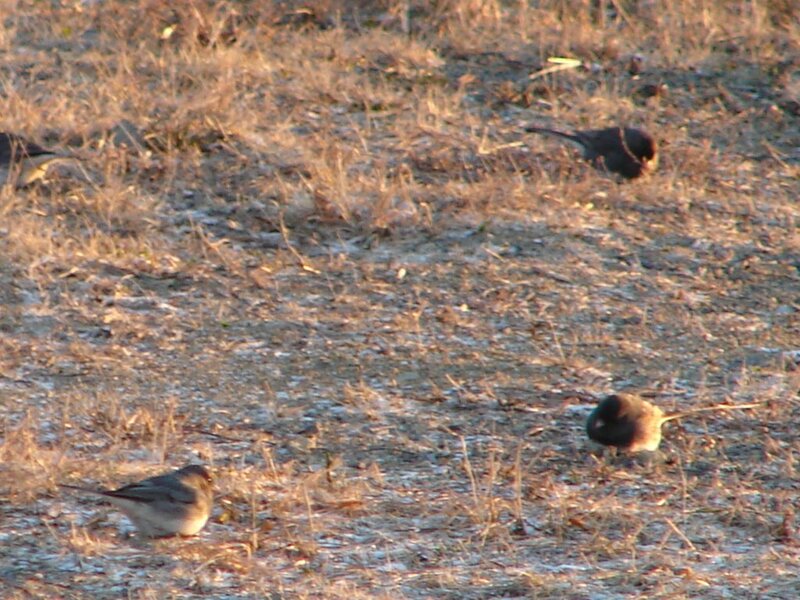 Virtually all of them of are juveniles who hang around long after the older birds have gone to warmer climes. I have had juveniles before well into December. Typically, they disappear with the first big snow. This year, I have yet to have a big snow, so it really isn't a surprise to have one hanging around in late January. As I haven't seen this particular bird before, I'm going to guess that it has already come from someplace north of me and is now on its way south. Whether it will keep moving or hang around in this area until I get more snow is the open question on this bird. The official amount is reported as a "trace," but I have waay more than that, probably at least a quarter of an inch. But the first semi-measurable snow of the season is at least two and a half freakin' months later than usual, and I'm not happy about it. Of course, the snow this morning is so pretty that I'm finding it a difficult at the moment to work up much steam over that. Perhaps tomorrow. 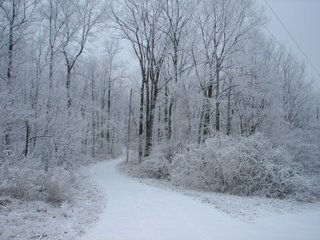 The first picture is of the driveway on the way up to the cabin. I love how everything is kind of monochromatic. The tree in the photo on the right is a white pine. Once I got off the mountain there wasn't much snow. I think the valley got mostly freezing rain. I didn't have that, but I must have had some time of wet snow for it to stick to each needle like glazing on a doughnut. Of course, having the wind be dead still doesn't hurt either. 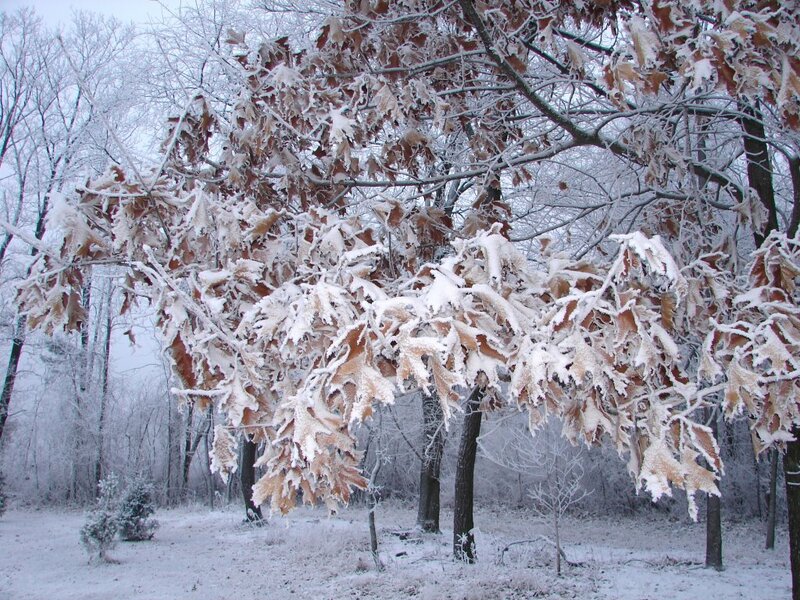 Sometime trees, often oaks, don't lose their leaves in autumn. That's what the tree on the left is. I've never been able to figure out why that is so, as a tree that doesn't lose its leaves one year might well lose them the next year. So what triggers the leaf drop/no leaf drop is a mystery to me. But when the leaves don't drop, and then it snows, this is the result. I can't see a stone fence without thinking of Robert Frost's poem "Good Fences Make Good Neighbors." Perhaps it is because I live in an area with so many stone fences that this poem is often in my mind. Or perhaps the vice versa is true. This stone fence is one of many I see when I come out of the woods and off the mountain and head towards the city for work. Some are in good repair, as this one is. 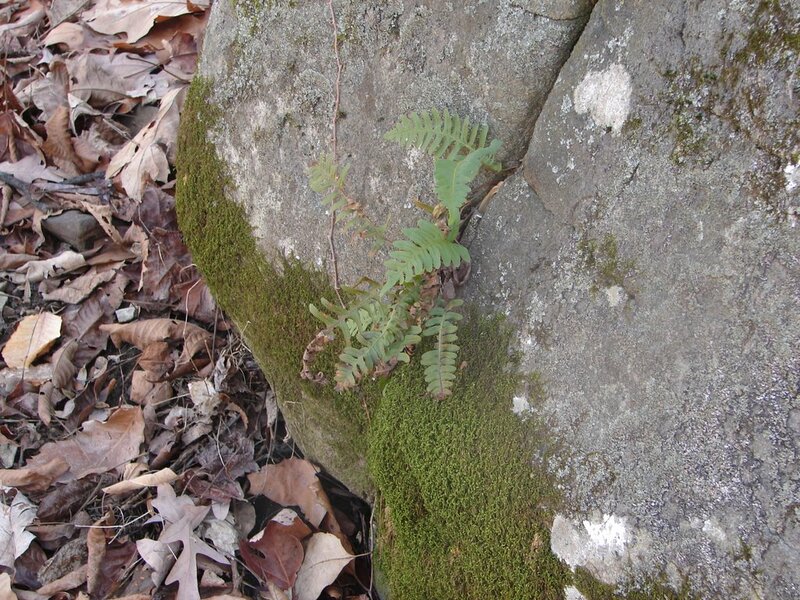 Some are vine-covered, forgotten and nearly invisible. It is not uncommon to walk anywhere in forest in this area and suddenly come upon one out in the woods. Perhaps a farm was once nearby, though that must have been long ago, if so, as the woods around these mystery stone fences are nearly always mature and well-established, not new growth. 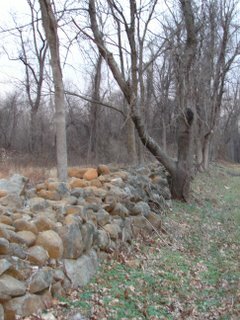 A stone fence serves as the boundary line through the woods on my father's farm. That one is a bit unusual. 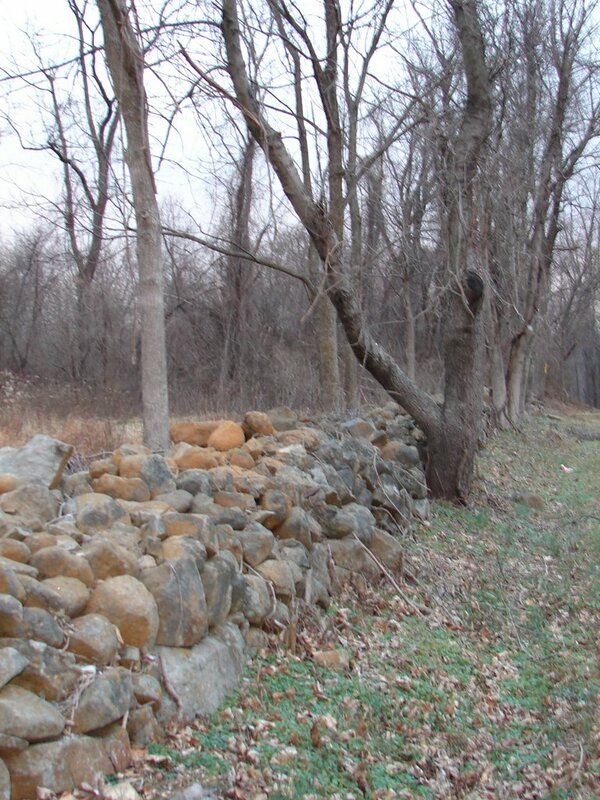 Stone fences most often mark pastures or kept farm animals in or out of a place. But my father's woods has never been a pasture, as far as we know. 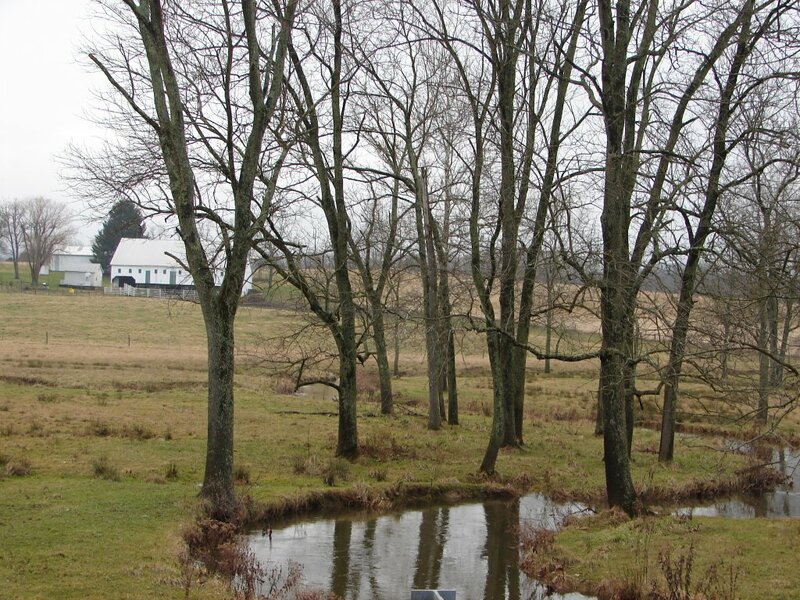 The trees in his forest are large and mature, as they are on the other side of that stone fence. 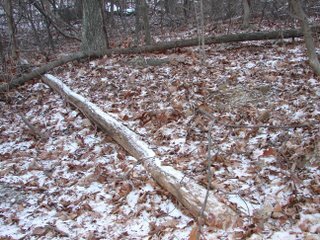 So that stone fence was apparently always just a boundary line through the woods (but would have been a lot of work to build just for that). Here on the mountain, a trace of snow fell overnight, not enough to call a dusting, only enough to gather on my wiper blades and sit in a few nooks and crannies. I've tried to build my own stone fence along the driveway at the cabin, to little success. It takes a lot of rocks (which I have, though most are not easily pried from the ground) and a more effort than I expected. Once, I had a fair amount done only to have a snowplow knock down most of it when they tried to plow my driveway. But like Frost's poem, I always find myself starting again. Stone fences make good neighbors. As you can tell, today's photo isn't from the mountain. It's a picture of the old barn on my family's farm. 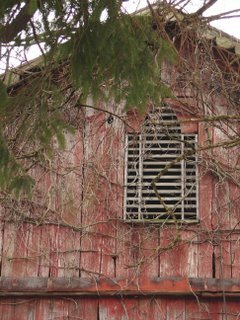 I like the way the vines are crawling all over it. It is a bit lighter in the mornings, now, so for several days I have been taking a photo somewhere on the mountain before I left for work. But this morning was very overcast, and it was too dark for a photo. That's what I get for trying to push the morning light a little too far too soon! 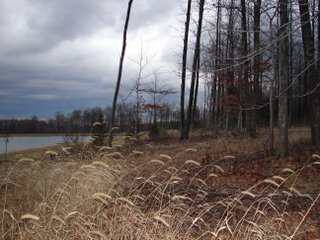 I am hopeful that I might soon have some snow to brighten the brown woods, if only a little. 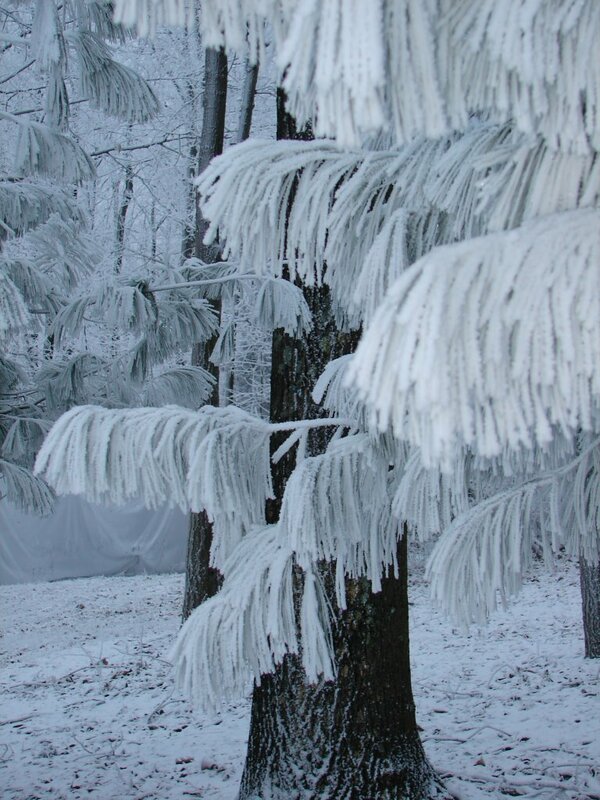 It has now been below freezing for two days, a new record for this winter. Still, that's not long enough to give the woods a truly wintry feel. I'm starting to lose hope that winter will bother to make an appearance this year. What a difference a day makes! This morning it was 14°F. at the cabin. Yesterday morning it was 43°. It feels quite a lot more like winter this morning, though somewhat to my surprise I can still sense differences between how the this morning feels with how a similar temperature would feel during a winter that is a long stretch of these temperatures. I am not as sure I can describe this difference in so many words. But naturally I will try. As best as I can describe it, this morning’s cold doesn’t feel “deep” yet. Oh, the ground is hard again and the cold bites well enough, but in a long winter of cold temperatures, eventually coldness will seep into everything. There is no shelter from it, no covered up piece of outdoor furniture or forgotten rake that is left unpenetrated by the cold. Bird seed kept in a tin and then a plastic bucket and covered with a tarp is still cold through all those layers. It is the same for the trees and the ground and the rocks of the forest. In a normal winter the cold gets into everything. This is a good thing as it kills much of that nasty bacteria that can cause disease. A good, solid deep cold helps keep the numbers of mosquitoes and other insects down in the summer. This is especially concerning here because of West Nile virus. Anything that can help reduce the spread or ferocity of that is a good thing. It will take some time and many more days of cold like this, though I don’t know exactly how many, before the cold temperature can seep into all the nooks and crannies of the forest. I would expect that it will take weeks for the process to work fully. I just hope we get that much cold before spring. One day down and hopefully many more just like this to go. Living in this winter is a bit like time traveling. 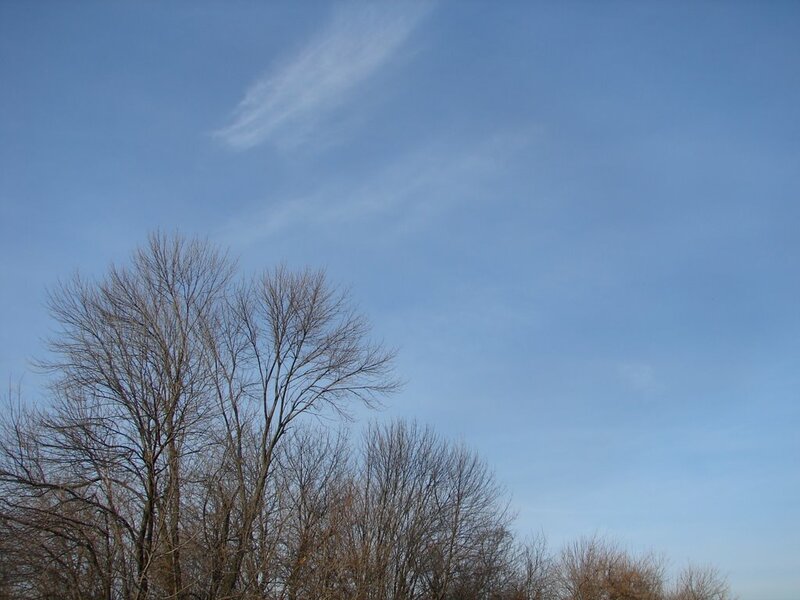 Although the date is January 16, the weather this morning is more like late October—certainly not like a January. Last night, after dark, the weather still felt like sometime in late September. I sat outside on the front deck for a while, watching the fog finally lift after three days of gloom. I watched the distance that I could see grow by the moment. For most of the weekend, I couldn’t see across my driveway, let alone to the end of it. After dark the weather system that is supposed to bring January to the region started to move in. At first, before the wind picked up, it was still warm, though I could watch the fog already start to dissipate. First, I could see to the end of the driveway, then I could see the surrounding trees. By the time the temperature started to drop and I was no longer comfortable sitting outside, I could see the next mountain over and the few lights from the houses that sit along the base of it. This morning the temperature is dropping, and the big stormy clouds I usually see in October fill the sky. It is now light enough in the morning again to take a few photographs, though the light is still flat with the remnants of night. By noon it will be November. By dark I will be back in January. I took this photo of Roundtop this morning as I left for work. The mountain reopened for skiing last evening, and the parking lot was nearly as full as it would have been for a weekend day. Lots of people came out to ski last evening on some good snow. It is starting to be lighter now when I leave for work in the mornings, which I always look forward to. I love colder weather but I don't enjoy spending all the daylight hours of a day at work and then only being at home during the dark (except for weekends). I start to feel a bit like a vampire until the light returns. Last evening I took both Dog and Baby out to play in the snow. No, I don't have photos of that. I'm not coordinated enough to handle two large dogs and a camera at the same time. Perhaps I'll do some dog-snow photos this weekend, one dog at a time. Dog was not completely impressed with the patch of packed snow that I let him play in. He's a real powder hound , and the snow along the edge of the road was pretty well packed. Baby Dog just loves to slip and slide around. She runs in a circle until her feet slip out from under her, and she slides a good 10 feet before getting her feet back under her. She is easily amused. I also took the second photo this morning--a little bit of alpenglow on the top of the mountains across the valley. The sun was only out momentarily before slipping behind cloud cover again, but it made for a nice start to the day. And now, I didn't get to see Comet McNaughton last night--too many clouds. Note: Go outside after sunset tonight and look into the west. Just above the horizon you should see Comet McNaughten! Note2: After 1.5 days of snowmaking, Roundtop will open today again at 4 p.m.
Colder weather has returned to the mountain! It almost feels like winter again, though the temperature is still more in the mid-February range of winter temperatures than those of mid-January. Still, it’s quite an improvement. The ground feels hard again, not muddy. Dog and I walked in the woods before dawn this morning, over to the new pond, which sat calm as glass, reflecting the stars of the night sky in its watery mirror. 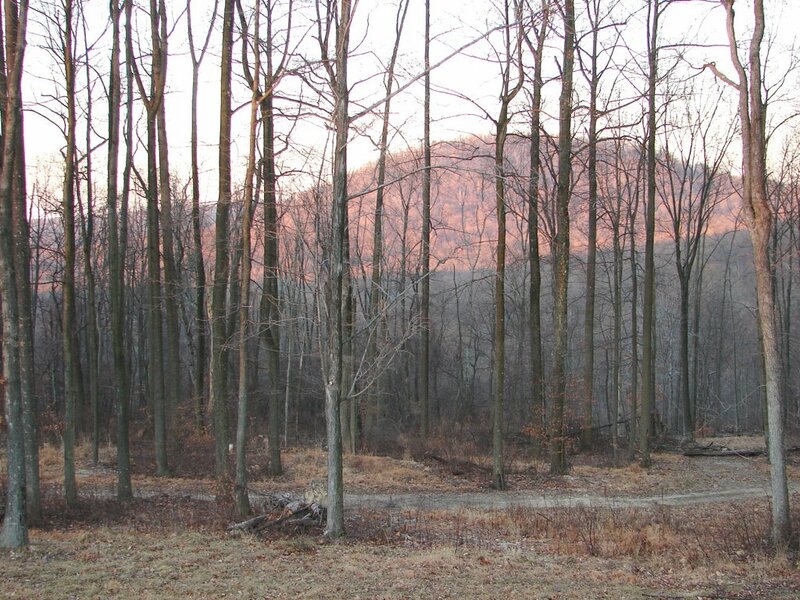 I think trees, even leafless trees to some extent, must muffle the sounds of the non-forested world that surrounds the northwestern side of my little refuge. 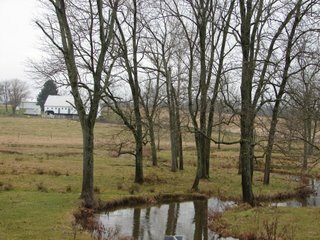 When I am out of the forest and in the open space created by the new pond, I hear more sounds from the nearest public road and the houses along it than I otherwise do. This morning, out at the pond’s edge, I heard a distant dog barking, to which Dog felt compelled to answer in kind. I heard a car door slam, heard a car out on the road. In a way, it’s a little startling, to be sitting at the edge of pond, surrounded by woods on all sides and suddenly hear sounds from beyond the forest’s edge. These sounds encroach this deep into my world only in winter, when no leaves muffle their sound. I am not so naïve as to think that I or anyone can stop the towns from expanding anymore than I think I can stop people from cutting down the forests around me. Sometimes I wonder how much longer the forest here has left? Fifty years? 100? Less? I have no idea. Sometimes I feel like one of the last dinosaurs, when the world around is already favoring those upstart mammals. I can still separate myself from much of the clatter and bustle, but it is still there, encroaching on the woods, encroaching on the silence, acre by acre, foot by foot. It's gotten cold enough to snow a bit here. Finally! I went outside after dark last night and was greeted with the sensation of snow flurries on the face. It has been 6 weeks since I last saw any snow, and the surprise and sensation of these was most welcome. I'd almost forgotten how beautiful they look and feel. Unfortunately, the flurries only lasted a few minutes so imagine my surprise when I got to work this morning and find a dusting on the rooftops here in the city. Just to the north and west of me, the schools are delayed for two hours to give the road crews time to salt the roads. That little storm must have just missed me, more's the pity (as my grandmother would have said). Anything that isn't brown stands out in the brown forest that around me right now. 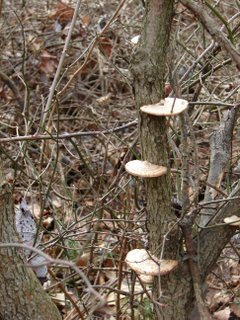 On my unexpected Sunday walk (unexpected because I usually spend Sundays working at Roundtop), I found these fungus, commonly known as shelf or bench fungus. Fungus of all types are a lot more visible now, and most of them are pretty interesting to look at. Certainly there's many more different types than I remember seeing before. 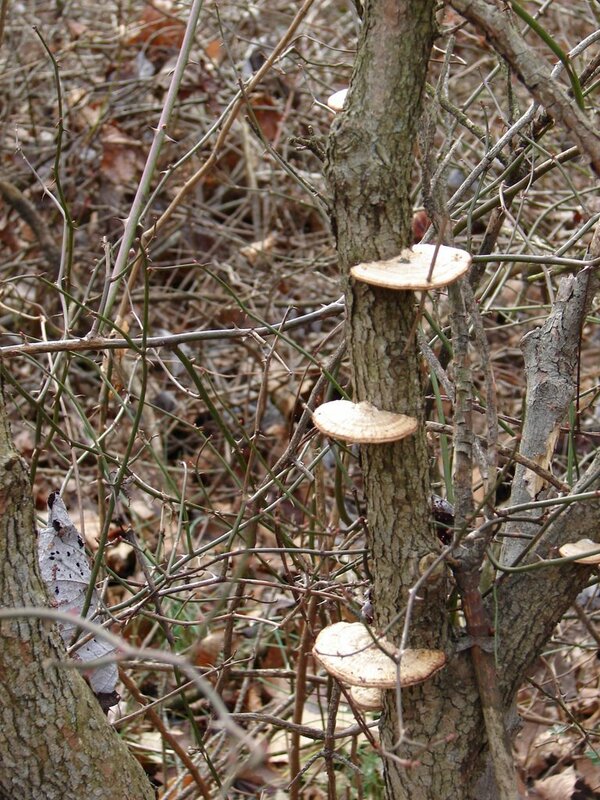 I kind of lose track of looking at fungus, though, when I'm busy looking at flowers and birds or animals. I'll have to remember not to do that anymore. They're interesting. Notice how this leaf is speared onto this broken branch? 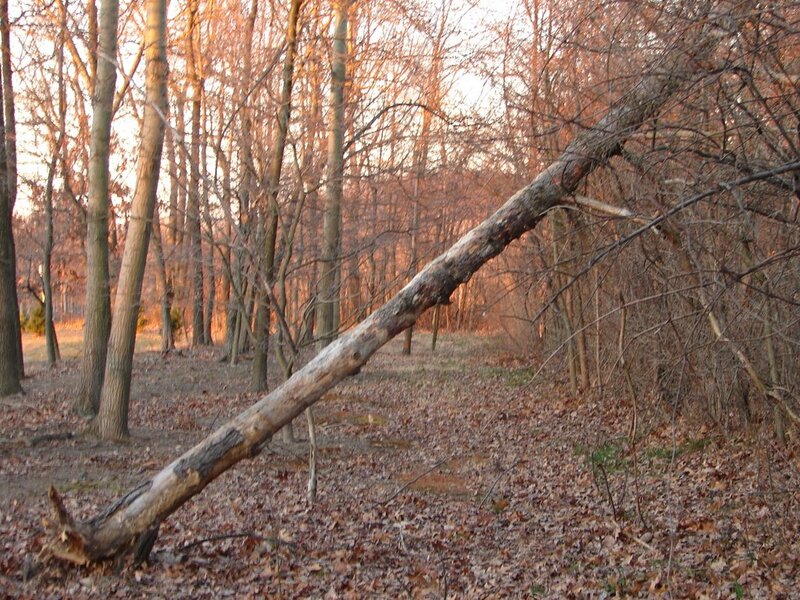 When I was out walking in the woods on Sunday, I was trying to find something that wasn't brown to take a photo of. With no snow cover around, the winter forest is simply not as visually interesting as I'm used to. 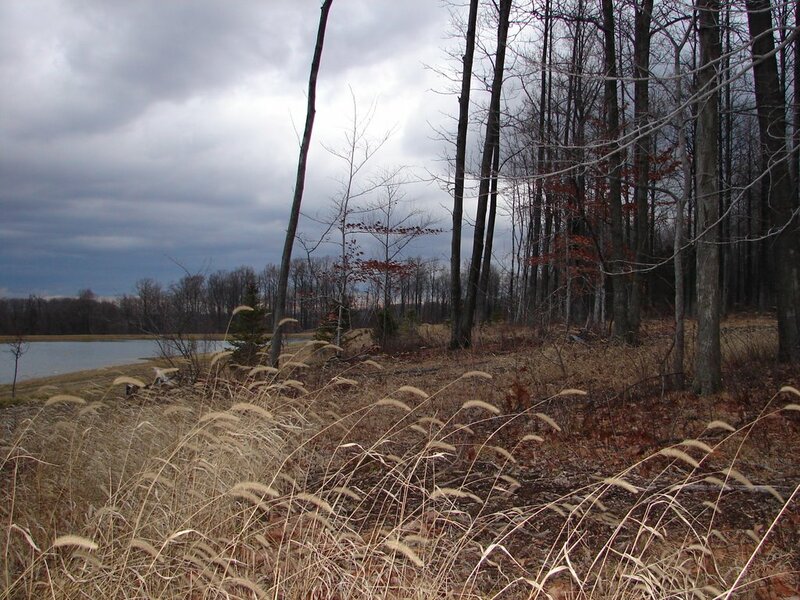 The woods are a near monochromatic shade of brown, surrounded by brown mud and browner leaves. So I'm walking on a path and I notice this paler color on a tree perhaps 50 yards off the trail. I can't figure out what it is. 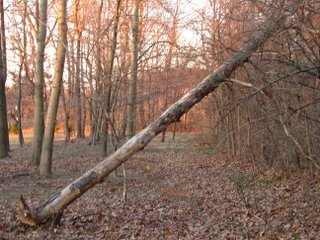 At first I think it's a sign on the tree, but I can't figure out why a tree well off the trail would have a sign on it. And then I think it must be a fungus, which might be an interesting thing to photograph. 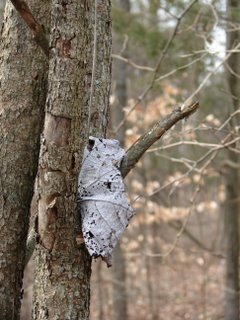 But I'm too far away to see what it is, so naturally I have no choice but to head off the trail and into the muddy woods to try and figure out what it is. I'm traipsing through thorns and brambles pulling at my pants and piercing the cloth (and my skin). I'm getting mud on my boots, slipping on wet rocks hidden by fallen leaves and trying not to fall and/or drop the camera. And then I'm finally close enough to see what this paler object is, and it turns out to be a leaf speared in its falling by a broken tree branch. The resulting find was a bit anti-climatic, to say the least. However, perhaps there's a parallel here; I ended up speared with thorns myself on my way to find nothing more exciting than a leaf speared by a branch. I think this shows nothing more but how desperate I am to see something that's not brown. Compared to all this brown, something gray looks interesting and was enough to entice me into a semi-treacherous mini-expedition just to see it. It's amazing the trouble that boredom can create, isn't it? This is how Roundtop looked yesterday. It's not a pretty picture at all. With a little luck, this photo should change in the next day or so, as it is supposed to get colder again, and the resort should be able to make more snow. Unfortunately, for cold weather enthusiasts like me, it's only supposed to stay cold for three days before warming up again. I suppose if I could find any good news in the expected future warm-up, it's that it's not supposed to get nearly as warm as it was this past weekend, when it set a record (67 degrees F). Instead of 30 degrees above normal temperatures, it's only supposed to be 10 degrees above normal during the upcoming weekend warm-up. It has been quite rainy here, limiting my wanderings. I don't like traipsing through mud, and every place I walk is ankle-deep in that right now. I had a respite from poor weather for a few hours on Saturday and took both Dog and Baby Dog for extended walks--or at least extended compared to earlier in the week. I haven't been able to get as deep into the woods as I prefer, but it was better than walking up and down the driveway. Baby Dog needs some camping practice, and I did find a spot where I hope we can "practice camp" later in the spring. I haven't yet attempted taking both dogs camping at the same time, as I don't think I'm ready for the fracas I expect that will be. I keep hoping that Baby Dog will settle down with a little more practice so that her antsiness won't infect Dog. At first I hoped Dog would be a calming influence, but the reality was that her unease infected Dog, rather than his calm settling her. Such is life. I've been asked a few times if I'm seeing any signs of spring around the cabin. The answer is no, not really. Certainly I've seen no new plant growth, unlike in Washington, D.C., where the cherry blossoms are apparently out, at least a few of them. I have seen some grass that's has a suspicous green tinge to it. And I have moss in the middle of my driveway that's pretty green. But normally I can't see moss in January at all, since it's usually covered with snow, so I don't have anything to compare this with. One thing I've seen that is unusual is that I saw a black vulture yesterday. Black vultures are the more southerly loving cousin of turkey vultures. Until 10-15 years ago, I'd never seen one at all in Pennsylvania. They are still less common here than the turkey vultures. I think they are prettier than the turkey vulture, and they are better flyers too. The first time I saw one in Pennsylvania was on a hawkwatch, with someone calling out "immature bald eagle." By the time I'd raised my binoculars, it was obvious the bird wasn't an eagle at all, but a black vulture. Still, the person who'd never seen a black vulture before can be forgiven mistaking it for a young eagle, as these birds don't have the telltale "v" shape to their wings or the rocking flight pattern that is typical of the turkey vulture. Black vultures migrate in the fall, though apparently they don't go too far south when they do. 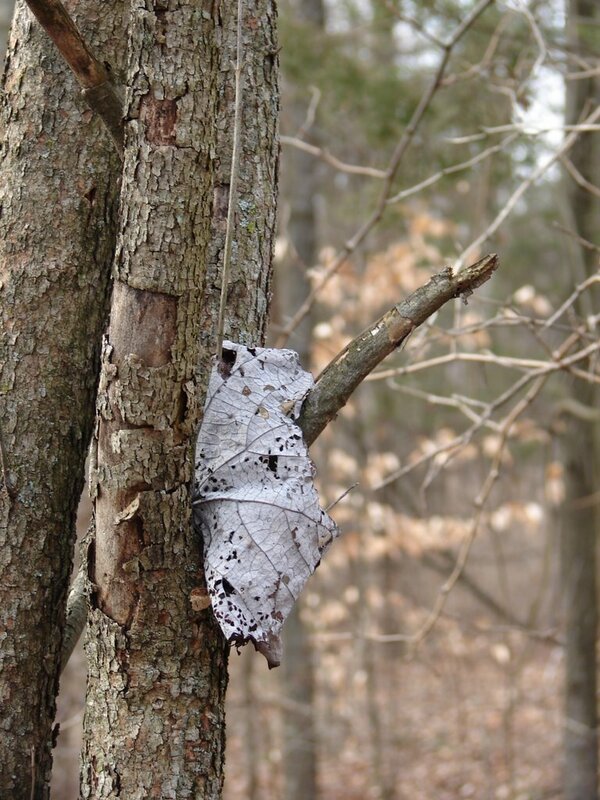 It is fairly common to see one on a warm February day with a south wind. Typically, they disappear again as soon as the snow flies, not to return for good until mid-March or so. But a sighting in early January is a rarity. Of course, it was in the mid-'60's here yesterday, a new record, and that warm wind could easily have drawn a few northward for the day. Today, the weather is not yet winterlike, but it is headed in that direction, though for how long is anyone's guess. Sometimes I think a perfect way to spend a day would be to sit outside and just watch the clouds march across the sky. I would pick a day that would be the day before a rain or a front moves through, as watching clouds form ahead of a storm would give me something to look at. I would look at birds, too, or anything else that I saw that looked interesting, but mostly I would just look at the sky. I imagine that to most people this sounds pretty boring, but I find clouds infinitely interesting. It would also be nice simply to have that much time to do something that proceeds so slowly. Most days, I find that time speeds along at a pace that is close to frightening. I seem to spend a lot of time doing many things at once; sometimes a quick glance at something is all the time I have before plunging in and moving ahead. How much better might my decisions be if I could take some time to think before acting? Or if I could make a decision on more than just a first impression? The only times when time moves slowly for me is when I’m doing something boring or when I’m not doing much of anything. So, I figure spending a day looking at clouds would be as good as way as any to make time feel slower. Imagine if you could spend multiple days in a row doing nothing but looking at clouds. A week might feel like a lifetime. I'd like that. I took this photo on January 1 as I was driving to sister’s house to celebrate the New Year. I had more than 1.5 inches of rain the night before, and all the creeks were high. 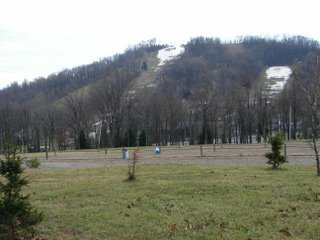 It’s cleared now, and Roundtop made some snow last night, though the temperature only dipped to the upper 20’s. I still can’t get used to a winter where the daytime and nighttime temperatures are about 20 degrees above normal. Dog and I walked over to the new pond this morning, under the light of the full moon. Although the eastern horizon was still dark, the moon was bright enough that I could pick my way through the woods and only trip once or twice. January’s moon is usually called Cold Moon—not exactly the case this year. 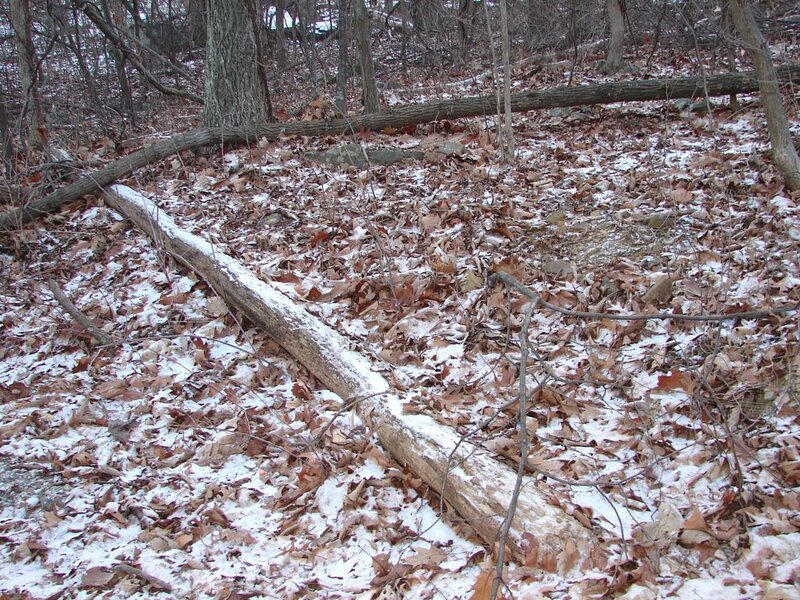 Some animals that usually hibernate, at least for a few weeks, are not hibernating. In the past two days I’ve seen two opossums killed on the road. Usually they disappear during the winter. So far, I haven’t seen any raccoons, live or dead, so I think they are hibernating despite the warm weather. In some ways, it might be interesting to see the differences in bird, animal and plant life that will take place because of the warm winter—though I wish that this was something I wouldn’t have to see. For the past I-can't-even-remember-how-many-years, I have spent at least part of my New Year's Day birding and starting my new year bird list. 2007 was, fortunately, no exception. Part of the reason I enjoy New Year's Day birding so much is that I get to start a new list. For a few minutes at least, even the lowly starling is a "new" bird. After you've been a birder as long as I have, seeing new birds is a rare occurrence, especially when constant travel to new places isn't an option. So we birders find our own ways of making the old seem new, and one of my ways is starting a new birding list each year. A new year list also allows us to compare our lists from year to year and see the differences. January birding, as a rule, isn't particularly exciting, but it does offer the chance to find all the resident birds in my area before migration starts. Migration seasons are always the best chance I have to see uncommon species. When I've already seen all the local birds, I can concentrate then in looking for the unusual. Eastern bluebird--not always an easy one to find on January 1, but the warm weather here helped. Feral Chicken--I just wanted to see if you were still awake.